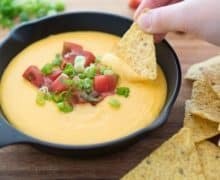 Nacho Cheese is easy to make yourself from scratch, and is the perfect melty sauce to pour over tortilla chips. This Nacho Cheese Sauce is made with only five all-natural ingredients, and takes 10 minutes to make. My very first experience with nacho cheese sauce was of the Velveeta variety. I was about 8 years old and had no concept of what processed food meant. 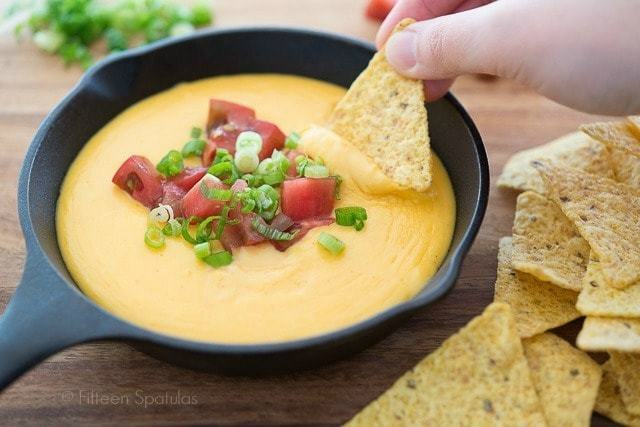 It’s perfectly possible to make smooth, creamy nacho cheese with natural ingredients, which is what we work with here. All you need is butter, flour, milk, cheddar, and a little cayenne. And of course, you can keep it simple, or you can jazz it up however you want. You can add tomatoes, jalapeños, scallions, ground beef, and whatever else strikes your fancy. Serve it alongside some Chicken Wings, Buffalo Chicken Dip, and Soft Pretzels and you have a full spread perfect for watching sports and having friends over. 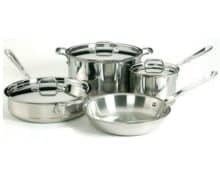 This method takes less than 10 minutes, and riffs on how you’d make a roux and a béchamel sauce for mac and cheese. 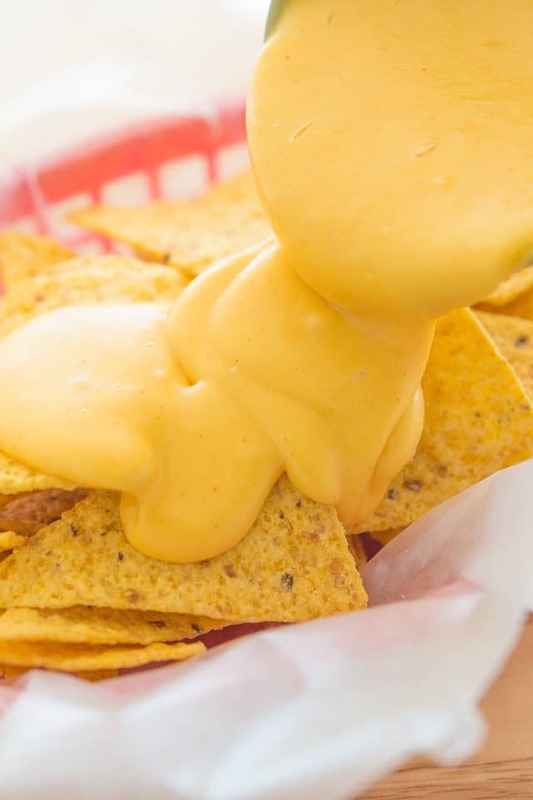 Because the ingredients are natural and chemical-free, know that the nacho cheese firms slightly as it cools. It has a luscious, smooth and melty texture as long as it’s warm, but if you let it cool, you’ll need to reheat it to get that flowy texture again. It does reheat just fine though and I’ll include instructions for that after the step-by-step. You can also keep it warm in a crockpot, fondue pot, or other warming dish if you’re serving this at a party. 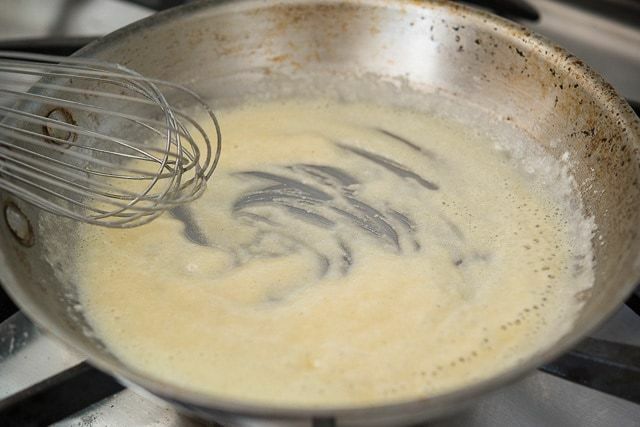 This is called a roux, and it will thicken our sauce. I like the heat that the cayenne gives, but you could also add paprika if you prefer. Once the milk heats through, the mixture should be thick and bubbly. The freshly grated cheese is important, because pre-shredded cheeses in bags usually have things like powdered cellulose that are there to prevent caking. Those will make your sauce grainy, so make sure you actually buy a block of cheddar and grate it yourself. It only takes a few minutes. If at any point the nacho cheese gets too thick and doesn’t “run” off the spoon, just add more water or milk, and whisk to combine. It will smooth out again beautifully. Basically what happens is when you cook the mixture on the stovetop, you run the risk of cooking too much moisture off, so you just have to add more. No big deal! (Since I’ve been asked so many times, this is the mini-cast iron skillet picture above). Pour over chips and devour. For more game day food, try these incredible baked Chicken Wings, Buffalo Garlic Knots, Crockpot Buffalo Chicken Dip, or Garlic Parmesan Wings. This Nacho Sauce is perfect poured on tortilla chips, fries, or for dipping with pretzels. 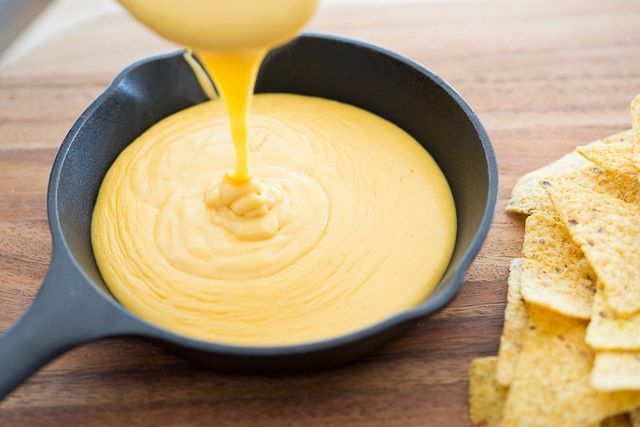 Heat the leftover nacho cheese in a skillet over medium low heat until melted and warm. Add 2 tbsp of water and whisk until the cheese looks smooth and creamy again (adding moisture should restore that creamy smooth texture). If the sauce is still too thick and doesn’t “flow” well, add more liquid and whisk again. Do not reheat nacho cheese in the microwave. Yes, but it will definitely separate, so you’ll need to reheat and whisk again to smooth it out, and probably add moisture. Follow the instructions above. I recommend a crockpot, a fondue pot, or a saucepan over a warming plate. 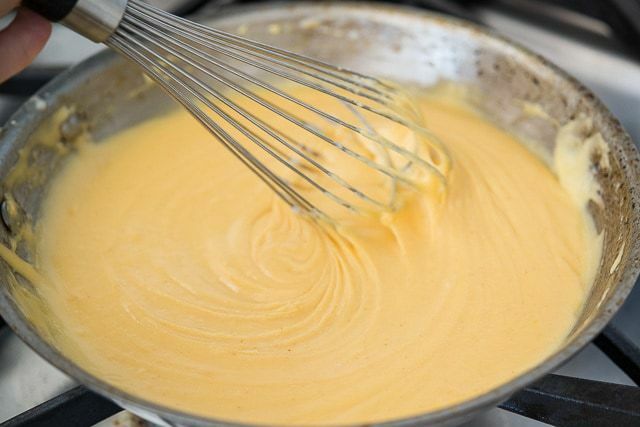 This from-scratch Homemade Nacho Cheese Sauce is made with only five all-natural ingredients, and takes 10 minutes to make. Perfect for football snacking! 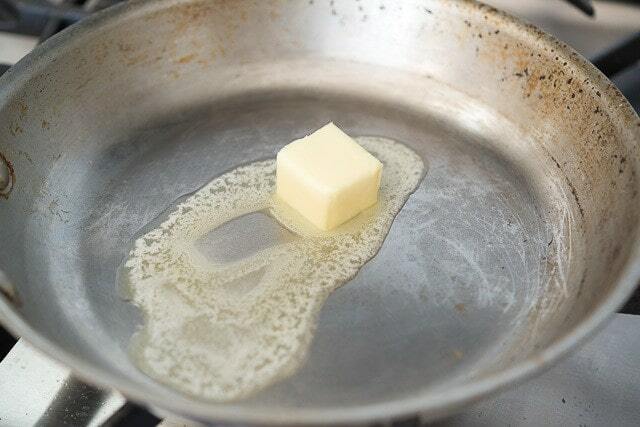 Melt the butter in a medium size skillet over medium heat. Once the butter is melted add the flour. Whisk until it combines into a smooth blond paste and starts to bubble around the edges. Add the milk to the skillet and continue whisking. Once the milk is incorporated, raise the heat to high and bring to a boil. 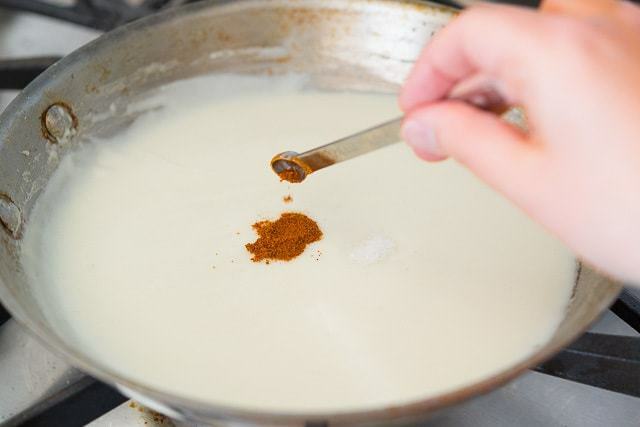 Once the milk has reached a boil, quickly lower the heat and reduce to a simmer. Allow the sauce to thicken slightly. 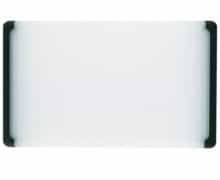 Turn off the heat, and remove the skillet from the stove**. 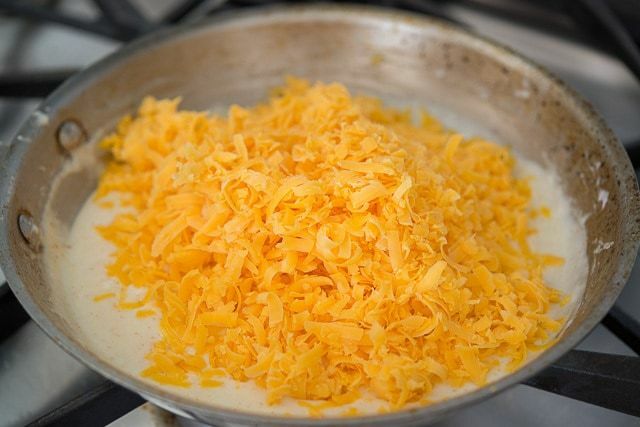 Add the cheese and gently stir, allowing the cheese to melt. 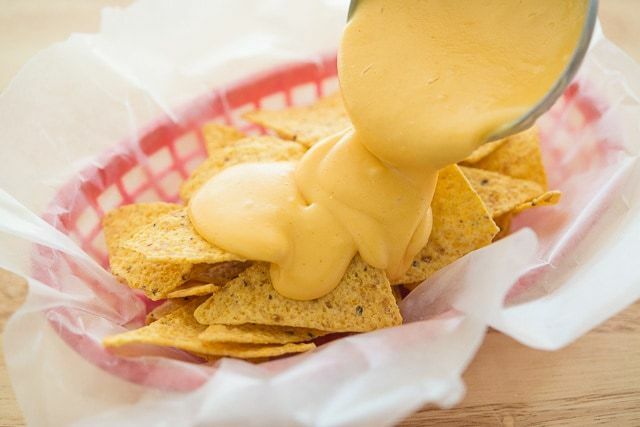 When the cheese is completely melted and the mixture smooth in consistency, the nacho cheese sauce is ready to serve. Enjoy immediately, as the sauce will get firm as it sits. **A few people have reported a gritty/grainy texture, which is usually a result of cheese being overheated. I have added this step of removing the skillet from the heat, especially if you have an electric stove, so the cheese does not overcook. The residual heat of the béchamel should melt the cheese sufficiently. You definitely don't want the cheese to bubble. Appetizers, Junk Food Makeovers, Sauces, Spice Mixes, Dressings, etc. Mine turned out grainy, not lumpy. What could I have done wrong? I used Cabot Sharp Cheddar and whole wheat pastry flour. Hi Rosemary, when you say grainy, do you mean that the sauce was not homogenous and smooth, or did it have any grittiness to it? My first guess is that the cheese might’ve gotten too hot, or it needed more liquid because the heat cooked off a bit too much of the moisture. Regarding the whole wheat pastry flour, I haven’t tried whole wheat flour before, so I can’t comment on that. The sauce had a fine even grain, not silky smooth. The sauce did bubble slightly. Was that too hot. The whole wheat pastry flour is very fine like all purpose white flour, not course like regular whole wheat flour. Hi Rosemary, I think if the sauce was bubbling, that was indeed too much for the cheese. Once the heat is turned off, it should only be enough where it’s residual heat gently melting the cheese, but not cooking it. I have added more notes on this in the recipe, to make sure to remove the skillet from the heat, so hopefully that helps. I’m sorry that wasn’t emphasized more, but this will be helpful to future cooks. Thanks! Can we store this in the fridge for a day or so? Hi Jen, yes it stores well in the fridge. I am an experienced cook and I’ve tried some cheese sauces before. This sauce worked the best no strange consistency with the cheese (usually most are grainy) this one was smooth. Directions were great. My family’s new favorite meal. Thank you so much. It’s going in my keeper pile of recipes. Hi Sarahlynn, I’m so glad to hear that this went so well for you!! HI! Can you put this in a crock put on a warming function to have at a party..has anyone done that? Hi Britney, I believe others have mentioned doing this. If it separates, add more milk or water and stir to combine.